Looking for the perfect spot for your next beach vacation to Northwest Florida? You've found it! Blue Tide sits on one of the loveliest beach cliffs on the Emerald Coast. The views of the gorgeous Gulf of Mexico are even better here! It is comprised of 18 units, all gulf front with awesome views. Beach access is directly out your back door using the private walkway. Start your morning with a stroll along the sugar-white sand of Seacrest beach and then head to town for the endless nearby activities. There are several gourmet restaurants nearby such as the Acme Ice House, Crabby Steve’s and La Cocina Mexican Grill and Bar. Cool down in the pool after a long day in the sand and surf. Enjoy lunch outside in the picnic area complete with BBQ grills so you can channel your inner “pit master”. If you like to fish, there are many local spots that will soon become your favorites. Enjoy the 30-A bike and walking trail to access local shopping, restaurants, and recreational activities at Alys and Rosemary Beaches. Browse our Blue Tide condos below and contact the property owner or manager directly to book online. ECBYO does not charge any service fees when you book with us. 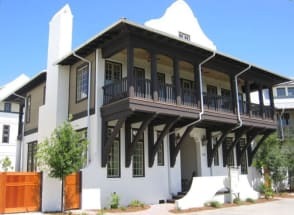 You can always find and book your favorite Blue Tide Condo on 30A here on ECBYO.COM.